I love museums, I love collections of historical items and frankly anything to do with history. Though I have a small collection of my own made up of posters, programs, magic props and one large illusion owned by Harry Blackstone Jr., it's not enough to satisfy my craving for history. So I seek out other collectors and have been fortunate enough to view a number of really wonderful collections. Every collection is impressive to me. I remember years ago Richard Kaufman showed me his collection of magic sets. It was just so cool to see so many wonderful examples of magic sets from all over the world. Ken Trombly invited me over to see his poster collection a couple years ago and that was truly amazing. But the one collection that has really stood out above all others for it's magnitude of incredible pieces has been Ken Klosterman's collection. He calls the area he displays the collection the Salon De Magie. It's awesome beyond words. But I'm not sure how many folks know that there is a second location, kind of an annex with some equally cool items. There is one item in that collection that really caught my eye. It's a prop that was once owned by David Bamberg. The item is the Fu Manchu Floating Ball. I am sure the ball itself was made by David's father Theo Bamberg. 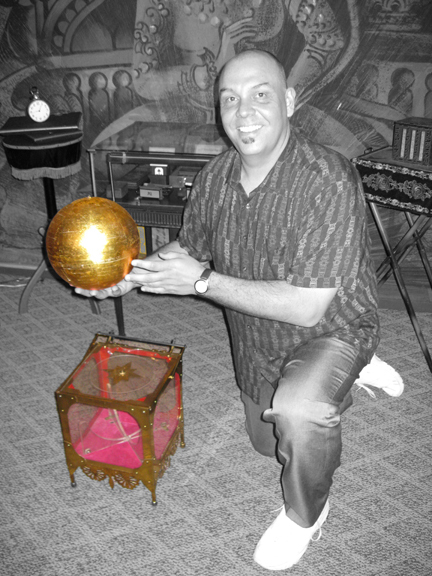 The ball is inside of a plexiglass box which was used during the presentation of the illusion. The plexiglass box is designed to have the lid open on it's own, as if by magic. The floating ball is often attributed to Okito (Theo Bamberg) but apparently, Theo learned the effect from David Abbott. Today, Teller presents a version of the Abbott Ball effect in the Penn and Teller show in Las Vegas. By the way, Ken Klosterman is now writing a monthly column in MUM Magazine which features a different item from his collection each month. I'm sure he'll also share with the readers the way he obtained the various items and from whom.